Tax exemptions for three years and concessions on capital gains tax. Compliance regime based on self-certification and no regulatory inspection for three years. A fund of Rs. 10,000 crore to back startups. Initially the corpus will be Rs. 2,500 crore. Also, a credit guarantee fund for startups. A Startup India hub - a single point of contact for interactions with the government. Atal Innovation Mission (AIM) for promotion of research and development including 500 tinkering labs, 35 public-private sector incubators, 31 innovation centres at national institutes, 7 new research parks, 5 new bio-clusters. 90 days for a startup to close down its business. 80 per cent reduction in patent filing fee and fast-track mechanism for startup patent applications. Also, a panel of legal facilitators for startups to file IP (patents, designs, trademarks) with costs borne by government. Relaxed norms of public-procurement for startups. No requirement of turnover or experience, but no relaxation in quality. 5 lakh schools and 10 lakh students to be involved in core innovation programmes. National and international startup festivals to provide visibility. A mobile app to be launched on April 1 making it possible to register startups in one day. 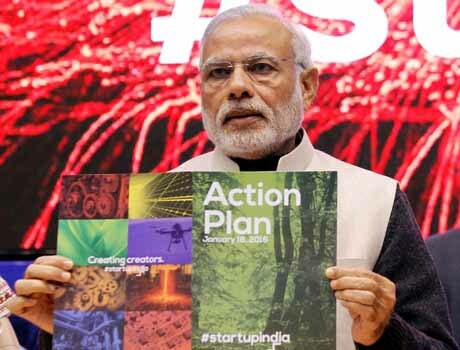 Narendra Modi's startup action plan top ten points, Prime Minister Narendra Modi had announced the 'Startup India, Standup India' initiative in his Independence Day address last year.